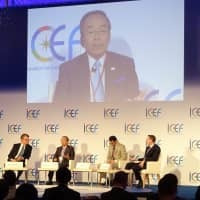 As climate change threatens to transform the world as we know it, the business sector needs to increase its efforts to deal with the threat by boosting investment in environmentally friendly firms and developing green technologies, business leaders and experts said at a recent international forum. Japanese firms often lag behind those of other countries in voluntarily disclosing information on so-called ESG (environmental, social and governance) issues and often consider such efforts as a burden. Yet Nobuhide Hayashi, chairman of Mizuho Bank, said the country cannot afford such an attitude, especially when it is scheduled to host the Group of 20 leaders’ summit next year. 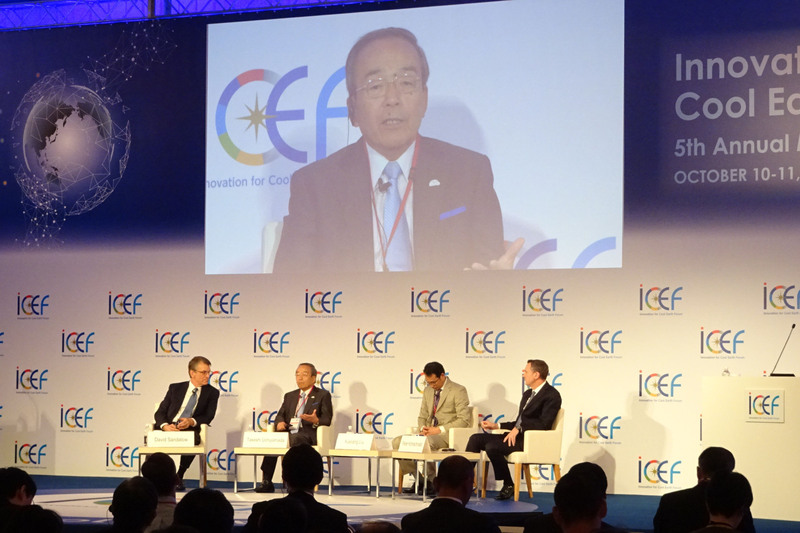 “(The event) will be an important turning point for the government and also the private sector to take environmental issues into account in Japan’s growth strategy,” he said during the fifth annual Innovation for Cool Earth Forum, a two-day event that took place from Oct. 10 in Tokyo. ICEF, hosted by the trade ministry and the New Energy and Industrial Technology Development Organization, also known as NEDO, is an annual gathering of international figures tackling climate change through technological innovation. “The companies should shift their mindset to view the environmental issue not as a risk to be managed” but as a chance for growth, Hayashi said. Financial institutions should proactively communicate with executives of their client companies to persuade them to make their corporate policies environment friendly, he added. However, the chairman of Mizuho, which deals with over 70 percent of Japan’s listed firms, said it is still unrealistic to impose ESG conditions on clients when it comes to lending money, since the level of effort varies in each company. Globally, however, more institutional investors are integrating ESG factors more systematically into their investment decisions, and Amundi, Europe’s largest asset manager, is one of them. The firm’s CEO Yves Perrier said ESG engagement is becoming the mainstream. The company scores its clients’ ESG efforts from “A” (highest) to “G” and won’t invest in those that score “D” or lower. The event, which drew over 1,000 participants from around the globe under the theme “driving green innovation,” also featured executives from the auto industry, who advocated the need to spread green technology. Takeshi Uchiyamada, chairman of Toyota Motor Corp., said Japan’s biggest automaker believes that hydrogen will play a key role in curbing greenhouse gas emission. In 2014, Toyota launched a hydrogen-powered fuel-cell vehicle model called Mirai. “We had a discussion within the company on whether hydrogen would really make society better. In the end, we came to a conclusion that it is essential to spread the use of hydrogen,” said Uchiyamada. FCVs have zero emissions, with hydrogen and oxygen working as an energy source to generate power through fuel cells to run an electric motor. However, greenhouse gases are emitted during hydrogen production when certain methods are used, such as those involving coal and natural gas. Uchiyamada said Toyota will keep its commitment to promoting hydrogen, saying that it will provide 100 fuel-cell buses in Tokyo by 2020, while the firm has opened up about 6,000 patents for other companies to develop hydrogen-related technologies and products. Liu Xueliang, general manager of the Asia-Pacific auto sales division at the Chinese electric vehicle-maker BYD Co., said it aims to introduce its EV technology worldwide. The Shenzhen-based company has been working to switch public transport to EVs in its home city, and Liu said all buses in the city are currently electric, while all taxis will follow next year. “We think it’s best to start the electrification with public transportation,” Liu said. This year’s ICEF came shortly after the publication of a special report on the impact of a 1.5 degree Celsius rise in temperatures compiled by the Intergovernmental Panel on Climate Change earlier this month. The U.N. body worked to evaluate how the world would be affected if and when the global average temperature rose 1.5 C from pre-industrial levels. “There are clear benefits from limiting global warming to 1.5 degrees compared to 2 degrees,” IPCC Vice Chair Thelma Krug told the forum. The IPCC says humans already caused about 1 C of global warming, a 0.2-degree rise per decade. Between 2030 and 2052, it will likely reach 1.5 C if the temperature continues to rise at the same pace. The historic 2015 Paris accord among 195 countries states that they will aim to keep the global average temperature rise to less than 2 C above pre-industrial levels and pursue efforts to limit the increase to 1.5 C.
The IPCC report shows how capping the rise to 1.5 C is challenging but also beneficial, in contrast to the 2-degree scenario. If the temperature rise can be kept at 1.5 C, the global sea level, for instance, will be about 10 centimeters lower, helping to keep about 10 million people on dry land by 2100. Water shortages will be mitigated as well. “The report is very clear that every bit of warming matters,” said Krug. Yet to achieve the 1.5-degree goal, carbon dioxide emissions need to be reduced by 45 percent by 2030 from 2010 levels, while anthropogenic emissions will have to be net zero by 2050. The report says renewable energy is expected to account for 70 percent to 85 percent of total power supply in that case, while dependence on coal would have to be cut to close to zero. “It will require unprecedented transitions in all aspects of society,” said Krug.